Algae are a diverse group of generally autotrophic organisms that range from unicellular (some phytoplankton) to multicellular (e.g. seaweed) forms. Most algae are photosynthetic, like terrestrial plants, but are not considered plants because their tissues are not organized into the distinct organs found in plants. Marine algae invasions have occurred worldwide due to accidental release or intentional aquaculture introductions. Most algae that have been introduced do not become invasive, but the ones that do can cause major impacts to marine ecosystems. Invasive introduced marine algae include members of the following groups: Chlorophyta (green algae), Phaeophyta (brown algae), and Rhodophyta (red algae). Two species of marine algae are listed on IUCN Invasive Species Specialist’s group list of the 100 worst invaders in the world: the green alga Caulerpa taxifolia and the brown alga Undaria pinnatifida. Tropical invasive algae include Gracilaria salicornia, Hypnea musciformis, Acanthophora spicifera and Eucheuma denticulatum. Gracilaria salicornia and Eucheuma denticulatum are prevalent on many of Hawaii’s reefs. Ecological impacts of marine invasive algae include changes in community structure in the invaded community and reduced abundance, diversity, feeding, performance, and function of native species. 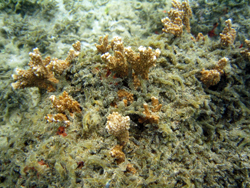 Invasive algae can quickly invade and take over coral-dominated habitats. They can overgrow and kill coral by smothering, shading, and abrasion, and can cause reduction in biodiversity and coral cover. Overgrowth of marine invasive algae can result in direct socioeconomic impacts. Algal overgrowth may look unpleasant to tourists and adversely affect recreational activities such as SCUBA diving and snorkeling. Major costs may also be associated with invasive algae removal. For example, the red seaweed, Hypnea musciformis, was introduced in Hawaii for aquaculture and spread to other Hawaiian Islands over several decades and formed extensive algal blooms. The blooms were stimulated by coastal pollutants and resulted in large amounts of rotting algal biomass that accumulated on beaches and created an unpleasant odor and environment. One study ref estimated that it cost Maui about $20 million per year to manage the impacts of the bloom (in terms of beach clean-ups, reduced property values, and reduced occupancy rates in hotels and condominiums in impacted areas). Global Marine Invasive Species Assessment — Global database with information on over 330 marine invasive species, including non-native distributions by marine ecoregion, invasion pathways, ecological impact, and other threat scores.